Goals from Dimitar Berbatov and Antonio Valencia helped Manchester United beat Fulham 2-0 and extended their lead at the top of the Premier League to ten points. With second-placed Arsenal, who now have two games in hand, not playing until Sunday when they visit Blackpool, United took full advantage. 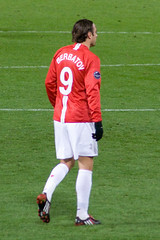 Berbatov’s 21st league goal of the season on 12 minutes was added to just after the half-hour mark when Valencia headed in from close range. Chelsea warmed up for the second leg of their Champions League quarter-final against United on Wednesday by defeating relegation-threatened Wigan 1-0. Florent Malouda with his first goal in two and a half months the Chelsea scorer. Fernando Torres made an appearance for the last twenty minutes and missed a couple of great opportunities to end his 12 hour goalless streak. With the win Chelsea move above Manchester City(who play Liverpool on Monday) and into third place. Chelsea are also within a point now of second place Arsenal. Spurs, in fifth, continued their pursuit of a top-four finish with a 3-2 home win against Stoke City. Peter Crouch somewhat redeemed himself for his sending-off against Real Madrid in midweek getting two goals. It was a tough day for all the teams at the bottom of the table as all three lost. Everton won 3-0 at second-bottom Wolvers, while Daniel Sturridge continued his fine form for Bolton with two of their goals in a 3-0 romp of West Ham. Roy Hodgson continued his good managerial work as West Brom eased their relegation worries with a 3-2 victory at Sunderland, and Blackburn Rovers and Birmingham City ended up in a 1-1 draw.